Do they have any cupcakes that use only unrefined ingredients in there - I am not allowed any refined food! Sorry if this has already been covered but I've scrolled through and can't see it. Go with muffin cases and trays. 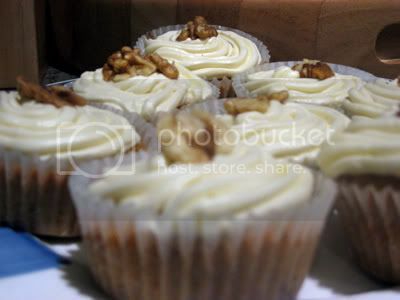 I made the carrot cake cupcakes w/ cream cheese frosting last week and they were FABULOUS. They had raisins and walnuts, which I'm not always a big fan of, but they were just great. I always plan to try to get all fancy and garnish and decorate them, but I never seem to have the time or energy to do it in the end. Hi there - I have made these twice now and both times they didn't rise - but tasted delicious - did yours rise much?? so it's not just me! they DO taste amazing though. Don't you love it when your omni friends/family "get it"? I've actually had a hard time getting a lot of the cupcakes to rise. I blame it on our crappy oven though. 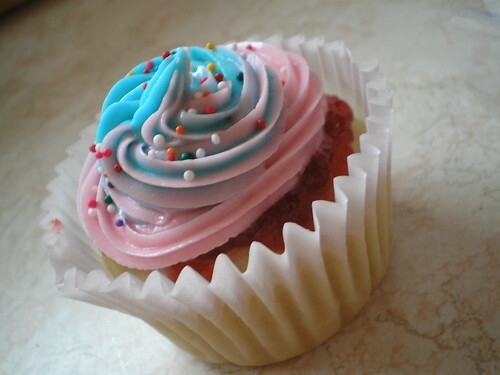 I usually just use it as an axcuse to fill the wells with icing so each cupcake is loaded with it! I know - she bought herself vegan with a vengeance at the same time and I am looking forward to the next meal she makes for me! 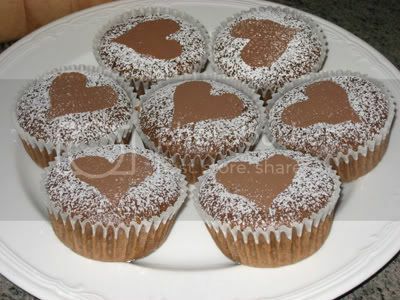 Tomorrow I'm attempting the gluten-free chocolate cupcakes, with ganache topping. A gluten-free friend is having her birthday, and our other friend is allergic to soy, so I'm trying for vegan gluten-free soy-free cupcakes. The three of us can never eat the same thing, so I have high hopes. The gluten- and soy-free chocolate cupcakes turned out well! I even had sprinkles in the pantry that turned out to be suitable for all. I was really worried pre-baking because the batter was super-runny, but they set up after baking an extra three minutes or so. The were extremely dense and moist, but in a good way. My gluten-free friend was so excited! The poor thing hadn't had cake in well over a year! ^^^^^^^^^^^^^^^^^^^wow, i need one of those cupcakes. !! i think yours look great, its not easy decorating tiny cakes. hopefully will take some pics and post up on this thread..if they look half as good as yours do PI, i'lll be reeeeally happy!! I've baked at least five different varities from this book, so I can say with certainty: They Rock! No photos; I was in too much of a hurry to eat them! I also got to go to the book-launch party at MooShoes (over a year ago) and sampled waaaay too many cupcakes! 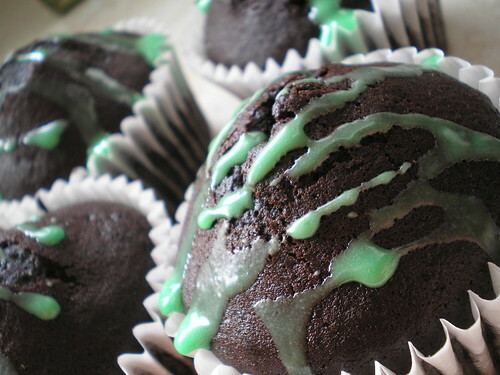 The best are the lime cupcakes--which I haven't made yet. They were so easy and everyone else's look so lovely I'll definitely make some more. I've been bitten by the VWAV bug. Made chocolate and raspberry with vegan cream cheese frosting. They look scrummy Ruby Rose, Earl Grey and Almond...that sounds delish! ooh, that does sound nice! they look great too. I've made loads from this book and haven't had a failure yet!? They all look so lovely - especially the Boston Creme ones Poison Ivy. aha..my first ever baking session from this book. these are to welcome my best friend home from her 3 week camping expedition...she'll find them in her fridge alongside a chilling bottle of chenin columbard. 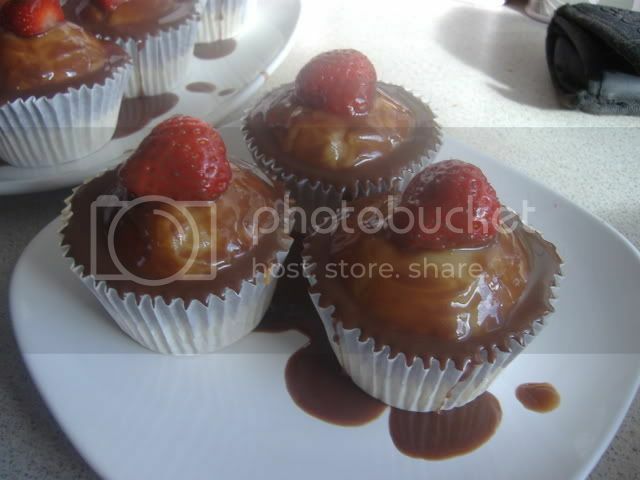 Ooh, they look fab EmmaP, did you use fluffy buttercream or did you fill them with the mousse? (I haven't tried the mousse yet because I can't buy silken tofu anywhere near here ).....yes, they look delish!! um..haven't perfected the frosting recipes yet...i'd say it was quite close to the choc buttercream frosting.. it's 'pure' soya..icing sugar, bit of soya milk and vanilla extract and cocoa powder stuff. the choc fudge frosting stuff needs soya milk powder??? *clueless* also clueless about shortening.um..didn't you tell me this was white flora?? am going to try the coconut lime ones next week.i say next week..probably the week after...they look pretty lovely. coconut oil..where would i find some of that then? soz poison ivy..i know this post is yonks old..was thinking you could pop in a vanilla pod into a cannister of sugar thats' 'specially' set aside for making cupcakes..then you have a constant supply of vanillary sugar.. sheer brilliance..eh? Soya milk powder you can get from Veganstore and also useful for making vegan Barfi (indian sweet). Don't bother with white flora, just use extra pure. 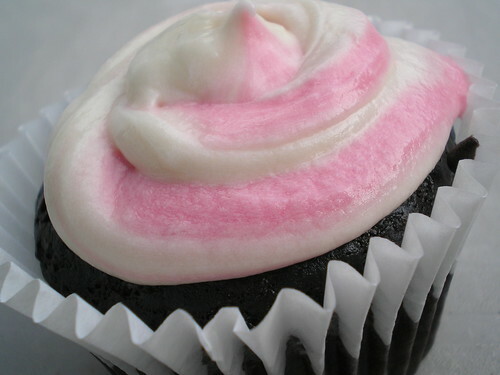 I always used to make butter cream icing with a little fat rubbed into icing sugar then a little cold water(plus cocoa or whatever). I found the all fat version in this book MUCH too rich. Also don't make anything like the quantity they suggest - as others have mentioned her. Your cupcakes look great BTW. i already sussed the ludicrous recipe quantities seem highly unnecessary i think they look amazing, true, but a small swirl with other stuff plonked on top or a smearing of whatever topping has to go down loads better...and teh strawberries on top totally made it. After seeing all these very yummy looking cakes I have sooooo gotta get this cookbook. agave syrup and vanilla cupcakes with vanilla buttercream raspberry blobbed on top and choc ganache...Mmmm..
in the dark dark times before, every cake i baked (eggs, butter, flour, sugar) turned out crap to average...vegan cupcakes are gonna take over the world!! Since everybody is posting pictures, here are mine. From tastiest to less tasty. 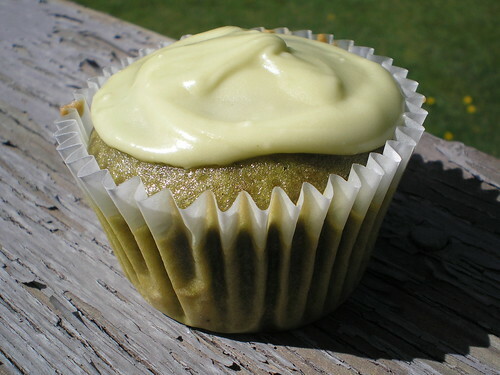 Green Tea Cupcake. These are GOOD. Esp. after being in the fridge for awhile. Perfect summertime treat. 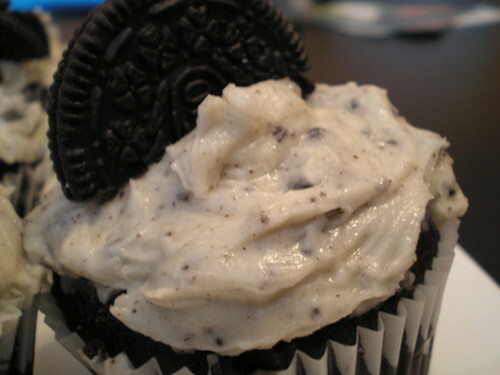 Cookes n' Cream cupcake. Realllllly sweet. Marbled cupcake- split to show the marble-y goodness. 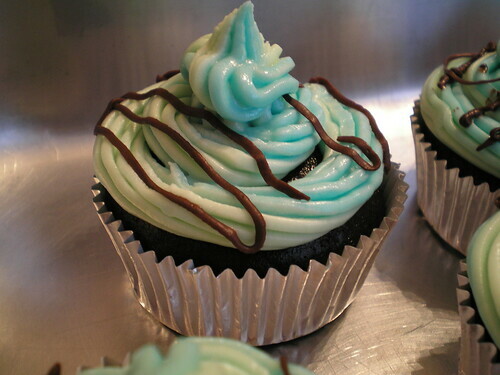 Chocolate cupcakes with a minty glaze. Vanilla with vanilla buttercream. I added lovely jam before piping, as I find the vanilla cupcakes don't have a lot of flavour. However, my vanilla is VERY cheap, so it's probably my own fault. Last edited by Allisa; Aug 19th, 2007 at 12:45 AM. Reason: eeek. why is that cupcake at the top like that? i can't get it off! Mom: It tastes just like a normal cupcake! Grandma: This is the best cupcake I've eaten in my life. Boss: You should open a shop and sell these. The cupcakes set up perfectly: very moist without being underbaked. This is only the second time I've ever baked *anything*! The recipe was very easy, and I didn't have any of the problems some other people have described (although I am a little OCD about following recipes exactly, so that may have helped). Oh, and I left a half cup of sugar out of the cookies and cream frosting, because several people here noted how sweet it was... came out just right. I haven't made any in weeks tho My fave so far was making the g-free choc cupcakes and topping them with banana icing, choc sauce & pecans, MMMMM! They were delicious. 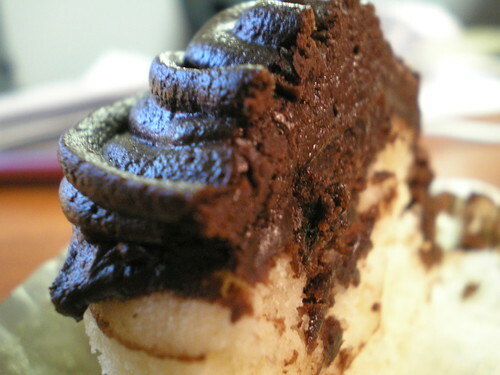 I am trying to go Raw but it's hard to stop thinking about cupcakes! omgggggg... you guys and your photos! they all look amazing. Have avoided baking for months because all the cupcakes I've made from this book have been awesome and I figure it's better to just not have the temptation there. Your cupcakes look sooo good. I made the carrot cake ones the other day, but they didn't look nearly as good as yours (they tasted wonderful, though!). 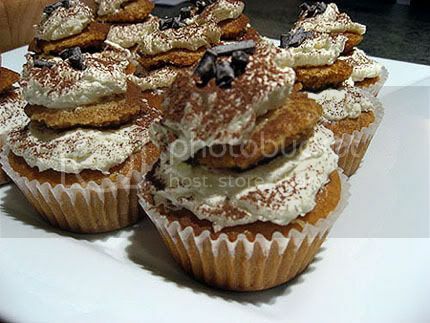 Last night I made the apple cider cupcakes. Everyone declares them amazing, and they've been approved for Thanksgiving. Moist and full of apple-y goodness, they are the perfect fall cupcake. On the downside, they were kind of a hassle because I had to buy apple cider, apple butter, whole cloves (only had ground...), whole allspice (again, only had ground), and agar agar (how long does this stuff keep?). I now have to figure out how to use all of these things, especially the apple butter and apple cider (I don't drink juice). I'm assuming I can grind the cloves and allspice to use in other recipes.... There was also one step to the recipe which involved reducing apple cider from 2 cups to 1 1/4 cups by boiling it. This took about 15 minutes, and then I had to try and measure boiling liquid with measuring cups. Then I had to wait until it returned to room temperature. Ugh. 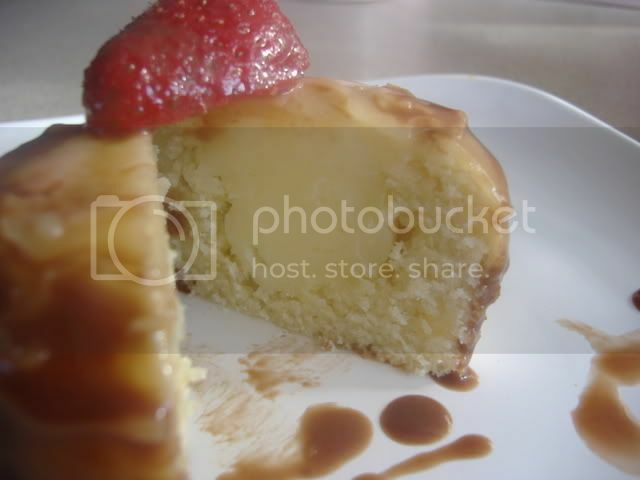 But if you have the patience to make them and the money to buy the ingredients, they are fabulous. Now if only I could find soy milk powder, coconut extract, maple extract, and green tea powder. Damn New Yorkers and their fancy groceries. look online at specialty gourmet suppliers for the best price. The quantities are small; so is the postage. good luck with your fancy recipes! Thanks for all the tips. I'll seal up my agar tight and check online for all the crazy ingredients!